Collection will only be made on streets, not alleys. 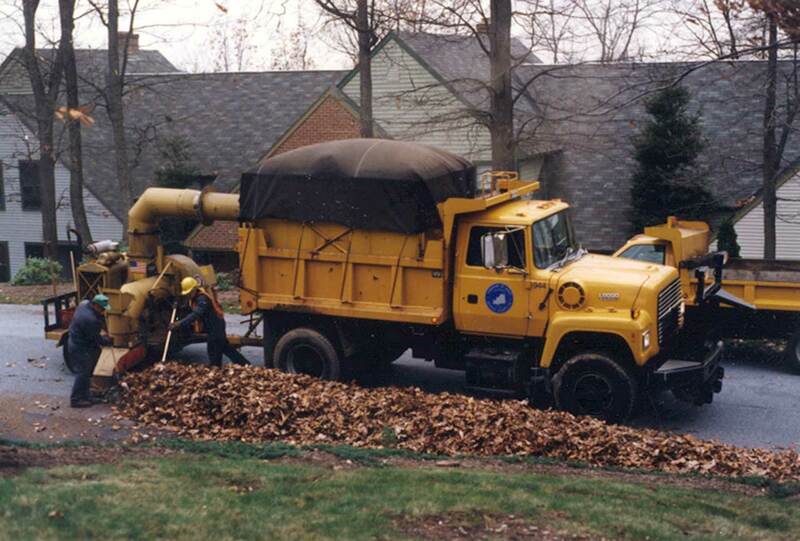 Foreign material in leaf piles can cause injury to the workers and mechanical breakdown of equipment. Please remove materials such as rocks, toys, boards, tree trimmings, etc. Please trim street trees to a height of 9′ above the cartway to allow leaf trucks, school buses, snowplows, and emergency vehicles to pass with ease. Please place basketball nets behind the curb to avoid contact with the leaf picking equipment and snowplows. The Department collects leaves beginning mid-October of each year. The collection schedule is published in the Fall Township Newsletter and the local newspapers early in October. Residents interested in having their leaves picked up are asked to place only leaves at the curbside for pick-up. Ridge Rd., Linden Rd., Brook Lane, Governor Rd., Clifton Heights Rd., Stone Creek, Dartmouth Farms, JoAnn Ave., Locust Ave., Middletown Road, Southpoint, Southpoint Commons, Mountain View, Orchard Run, Indian Run, Deer Run, Carol Acres, Carol Acres East, The Oaks, Waltoncroft, Derry Woods, Oakmont, Division St., Royal St., Old Quarry Rd., Park Village Plaza Rd. W. Chocolate Ave., E. Chocolate Ave., N. Lingle Ave., Lehman St., Wexford Rd., Brittany Dr., Hotel Rd. (area), Owls Hills (area), Trinidad Ave., Palmdale (area), E. Derry Rd., Center Rd., Park Ave. Some delays may occur due to inclement weather or an over abundance of leaves. Leaves and Yard Waste Leaves and Yard Waste will be collected by the contracted waste hauler on the last Saturday of the month during April through October. Items must be placed in a container not to exceed 32 gallons or in a “Kraft” bag not to exceed 50 lbs. Branches and tree limbs must not exceed 3″ in diameter, must be cut to 4′ in length, bundled and secured by rope or twine and not to exceed 50 lbs. There is no limit on the number of bags/bundles that can be placed curbside for collection. Note: Lawn clippings are not collected under this program and are to be collected as part of the 3 bag/container limit.